…and this is exactly what I show you in the Certified Digital Marketing Specialist (CDMS) training. In the current digital age, digital marketing is THE driving force for generating sales and revenue for a business. …the latest “bright shiny object” (BSO). The CDMS training is focused on core powerful fundamental concepts and principles. …you can’t build a strong house without a good foundation for structural support. This course shows you the EXACT principles you need to know in order to apply to them to anything such as Email, SEO, Facebook, Twitter, PPC, etc. If you’re asking which platform you should be using, then you’re asking the wrong question. It shows me you need to know these principles which will give you the exact answer to that question. If all you want to do or care about is “getting your name brand” out there, this isn’t for you. But if you’re in the business of generating revenue, sales and profits – this training is for you. The principles and concepts I show you in this course will stand the test of time and any technological changes. Once you know and understand these principles, you can apply it to any channel, digital, offline or more. 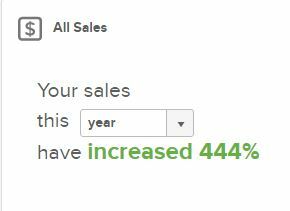 Here’s why understanding principles over just learning tactics that can easily and quickly become out of date is this…444% increase in sales. Do want CTR's like this? This is the framework that powers all successful digital marketing campaigns. I've been building and working on websites for over fourteen years, I share with you the common costly mistakes people make. I share the crucial elements to a high-performance website that works for you. Contrary to what you may think email is NOT dead. In fact, it's the "not so-secret" weapon of all successful digital marketers and businesses. I show you how email has been the most profitable channel, even now. SEO and organic reach is dying, but still has its place. Paid search can be highly profitable, but if you don't know what you're doing (or if you hire an agency that doesn't know what they're doing), you can lose a lot of money fast. If you haven't had success with content marketing but see everyone else doing it, this module pulls back the curtain to share with you how to do content marketing the right way. Which social media platforms should you be using? I show you how to answer this question. 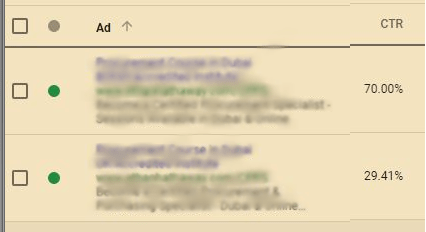 Is native ads for you? The certification exam is taken online and is multiple-choice. You have two attempts at the exam. You have 180 minutes (approx. 3 hours) to complete the exam. Exam fee is included in the course fee and may taken in the comfort of your own home. To become certified as a Certified Digital Marketing Specialist (CDMS), you must achieve 80% or more on the certification exam. *For in-person sessions, a minimum of 80% attendance is required to take the certification exam. 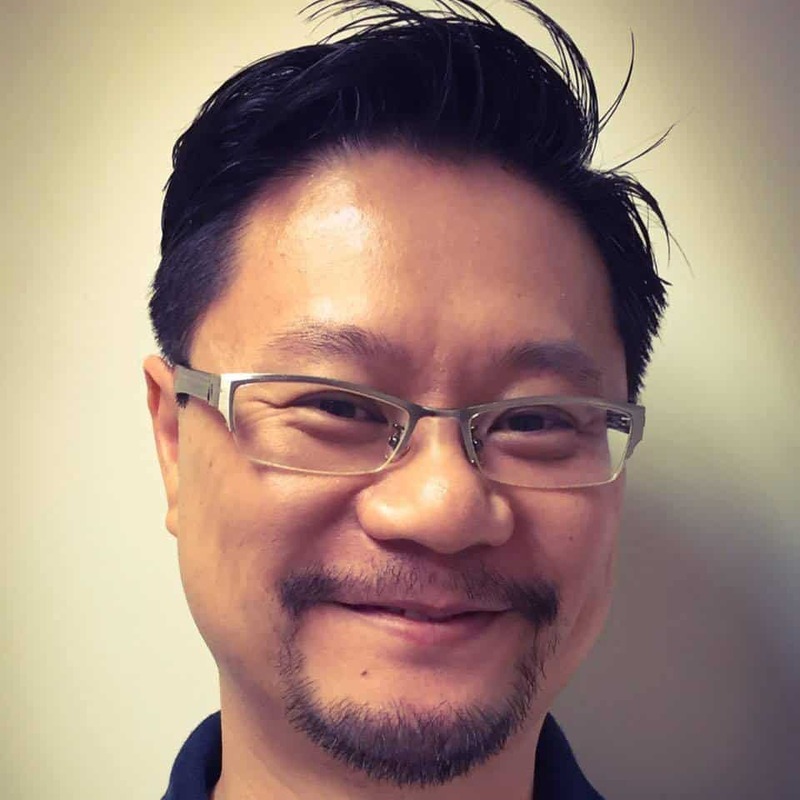 Vincent Po is the Managing Director and Chief Global Marketing Officer of Ethan Hathaway and Founder of Virtual Tree digital marketing agency. Vincent has been in Sales and Marketing for over 20 years. He is a Certified Funnel Expert and Google Adwords Search Certified professional. He's sold for one of the largest computer distributors in Western Canada. He's managed marketing campaigns for a large publicly-listed company and small startups starting from zero. He's designed and implemented marketing campaigns and funnels selling consumer products to high-ticket products and services to large companies. He's managed campaigns selling to five of the seven continents in the world. Vincent has a rare combination of digital marketing experience with technical web development background (very few digital marketers have the same combination of experience – most are either web developers or marketers with no web development background). Vincent has a Bachelors Degree in Science with specialization in Agricultural Economics from the University of British Columbia (UBC) and has a Post-Graduate Certificate in Computing from Monash University. Vincent is also a continued student of marketing and passionate about the topic. How Is The CDMS Course Different Than Other Courses? The CDMS is designed to give you key concepts and principles that DON'T change over time. The beauty of the CDMS course is it gives you the power to form your marketing strategy regardless of the media or channel (whether it's Facebook, Email, etc). Most other courses focus on tactics, but without a proper strategy, tactics are useless (and often times, will cost you money). Courses that focus on tactics and specific channels like Facebook or Twitter, quickly become obsolete before you even complete the course. The CDMS shows you how to apply the concepts and principles that matter so you can apply them to ANY channel or medium. Finally, the CDMS course is taught by an experienced marketing practitioner. Vincent is applying these strategies on a daily basis in real-life businesses with his OWN money (not blowing through some VC or shareholder's funding). 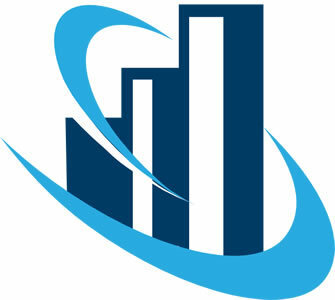 He has over 20 years experience in the sales and marketing field. What kind of instructor would you prefer someone with just a couple of years experience or someone with almost two decades worth of experience? "Very open interaction & discussion. Materials very relevant for my work. Many cases which help to put things into perspective. Bring your own campaigns to work on. Get answers to your campaigns during the course. You have unlimited LIFETIME access to the course lessons - study at your own pace. If you select this option, you're eligible for scheduled private online discussion group with our Expert Mentor. See scheduled intakes below. 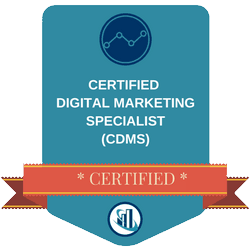 This digital badge designates you as a Certified Digital Marketing Specialist (CDMS)™, which you may use on business cards, resumes, LinkedIn profiles, website profiles, email signatures and more. In addition to the Certificate of Completion for the course in general, if you successfully pass the Certification exam, you also receive a CDMS™ Certificate to mark your achievement. You also get access to this training webinar I did with a LinkedIn specialist on how to leverage your LinkedIn profile to sell and market yourself on LinkedIn. You also get access to a step-by-step training for building your own WordPress website from scratch with no coding, programming or designing knowledge needed. We could charge $10,000 and it would still be of value because think of all the financial returns you gain from knowing how to generate sales in a systematic way. …the investment is only $1590. You get at least $67,158.64 of value for just $1590. That works out to just $4.36 per day…the price of a daily coffee or tea! *Part-Time courses are Thursday evenings 7pm-9:30pm and Saturday mornings 9:30am-12:​00pm over 5-6 weeks. **Full-Time courses are Mon-Fri 9:30am to 5:00pm. There is a 1 hour lunch break (lunch is not included). A: Yes, there is an online exam at the end of each core course. A: The exam is delivered online and at the end of each course. A: You only have to take the exam(s) if you wish to be certified. If you only want to take course and do not need certification, then the exam is optional. Q: What is the format of the exam? A: The exam consists of multiple-choice questions only. A: You must achieve at least 80% or higher on each exam to become certified. Q: Do I need to renew my certification once I am certified? A: Yes, you must renew your membership annually if you wish to continue using the CDMS designation. The reason why is because we believe as a professional, you should be staying up-to-date in your field to ensure you can be the best professional to your abilities, that means continuous learning. This is inline with other professional qualifications such as lawyers, accountants, engineers, etc. The certification exam is an unbiased assessment meant to objectively evaluate a potential delegate's learning and ability to successfully perform in this field. And finally, we are a British Accreditation Council (BAC) accredited international training centre. The BAC has worked hard at gaining recognition around the world as a mark of quality education programmes. Become a Certified Digital Marketing Specialist Today!